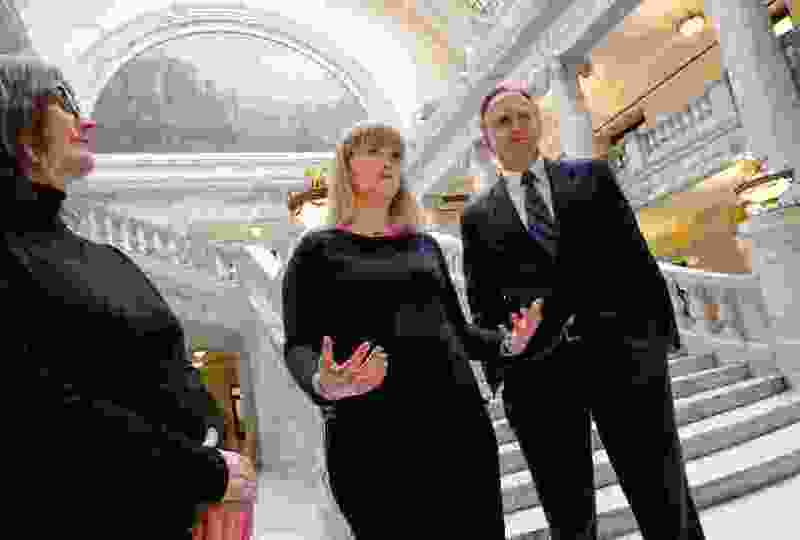 (Francisco Kjolseth | The Salt Lake Tribune) University of Utah Hospital nurse Alex Wubbels, center, is joined by her attorney Karra Porter and Rep. Craig Hall, R-West Valley, speaks with the media at the Utah Capitol after testifying in support of a bill that outlines when police can get blood draws. Rep. Hall, is sponsor of HB43 which passed out of committee on Wed. Jan. 31, 2018, and is the result of the widespread outrage after nurse Wubbels was arrested July 26 by Detective Jeff Payne who was trying to get a blood sample from a patient in her care. University Hospital nurse Alex Wubbels, who was arrested last year when she refused to allow a Salt Lake City police detective to get a blood sample from an unconscious patient, testified Wednesday at the Utah Legislature in favor of a bill designed to prevent similar confrontations. HB43, which outlines when law enforcement may legally obtain blood draws, will “make it loud and clear” that nurses and other health care professionals are there to protect people, Wubbels told the Senate Judiciary, Law Enforcement and Criminal Justice Committee. The bill was passed out of the committee with a vote of 6-0. It now heads to the full Senate. Representatives of the American Civil Liberties Union, the Utah Highway Patrol and the Utah Eagle Forum also urged passage. No one spoke against the bill, which last week passed the Utah House in a 72-0 vote. Wubbels’ attorney, Karra Porter, who also spoke at the hearing, said the bill is unambiguous and she believes the confrontation at the hospital would have been avoided if the measure had been law at the time. Sen. Todd Weiler, the bill’s co-sponsor and the committee chairman, said as a state senator, he wanted to apologize to Wubbels for what happened. “I was horrified, just absolutely horrified, when I saw what happened to you,” the Woods Cross Republican said. Wubbels was arrested July 26 by Detective Jeff Payne in an encounter that sparked widespread outrage after Porter released body camera footage of the episode. The patient was 43-year-old William Gray, a full-time truck driver and a part-time reserve officer with the Rigby, Idaho, police department. He was severely burned on nearly half of his body in a July 26 highway crash and died Sept. 25. Payne arrived at University Hospital a few hours after the collision to get a blood draw that had been requested by Logan police, who were investigating the crash. The detective arrested Wubbels after she repeatedly told him that hospital policy did not allow him to get the sample. Police Chief Mike Brown eventually fired Payne and also demoted Lt. James Tracy, the watch commander on duty that day, to the rank of officer for making the “completely unreasonable” order that Wubbels be arrested. Both men are appealing those actions to the Salt Lake City Civil Service Commission. Tracy’s appeal says he did not order Wubbels’ arrest, but had told Payne only that “he should consider” handcuffing the nurse. Payne’s lawyer has said the firing was improper due to the “circumstances of the events leading up to the disciplinary decision,” among other reasons. Salt Lake City and the University of Utah in October ended the possibility of a lawsuit by each paying half of a $500,000 settlement to Wubbels. Wubbels said at the time that she would use a portion of the money to help people get body camera footage, at no cost, of incidents involving themselves. In addition, Porter said her law firm, Christensen & Jensen, would be providing free any legal services necessary to obtain the video. On Wednesday, Porter said the effort, UtahPoliceVideo.com, has helped about 45 people so far.